The Mobi by Shaw Go service area now includes the Downtown Peninsula, roughly bounded by Victoria Drive, Arbutus Street, 16 Avenue, to the Burrard Inlet and into Stanley Park. With the present expansion, they are clearly making sure they catch the influx of commuters at the ever-growing Broadway & Commercial transit nexus. More importantly, I think it is a signal that this kind of integrated mobility system isn’t going away anytime soon, and will only get better as innovation and feedback drive the process forward. This entry was posted on Monday, April 23rd, 2018 at 3:23 pm and is filed under GW News, Other Writings, Technology. You can follow any responses to this entry through the RSS 2.0 feed. You can leave a response, or trackback from your own site. Is it being economically viable and sustainable? Any reports from the City? Not being a bike man at all myself, I haven’t followed the economics of it in any detail. I am however generally supportive of smaller scale multi-modal integrated transportation systems. I wonder what the bottom line would be for a scooter (i.e. Vespa, etc) rental system. Perfect for old codgers like me who no longer have the puff for bicycles. e-bikes (not scooters) is the next stage. I’ll wait for the Vespas. I totally agree. E-bikes would have much greater uptake. I used to be a very avid cyclist, but I’ve come to believe that it’s not reasonable to expect a substantial portion of the population to commute by bicycle in a city with this many hills. …and when it rains 8 months of the year I wonder if bike sharing can ever really be relevant part of a multimodal transit system. Seems a little late considering how many cities are now rolling the vastly more convenient dockless bike sharing systems. Mobi’s office and workshop are on Venables at 1383 near Clark. They should be watching the Mobi’s closely. But as noted above, the dockless system is the trend. And Bike Europe magazine is see large increases in e-bikes above conventional bikes “White Paper: E-Bike Trend Is Revolutionizing Cycling Sector” showing large increases in sales. Seattle has dumped the station system of Pronto and is going with dockless bikes. 3 systems Spin (Orange), LimeBike, and Ofo (Yellow) were set up in July 2017. Some have electric assist. 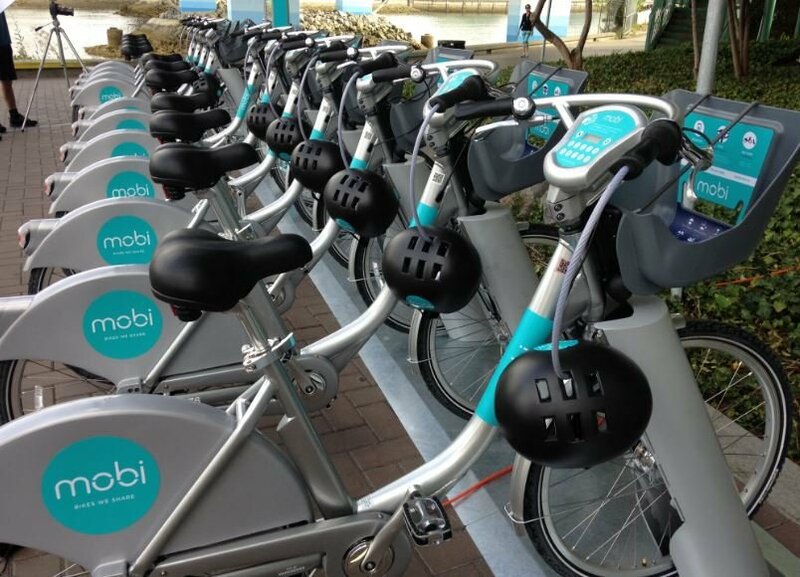 Still the Mobi-system bikes are too expensive to use, are heavy and the boundaries of the zones too small. It is cheaper in the long run to buy one’s own cheap bike for the same yearly fee as Mobi charges. I am expecting the new council will write-off the $5 million and let in Dockless systems, washing their hands of the systems. Vespas, underpowered 50 cc’s though they are, are a better idea. Interesting to hear that Seattle has dockless bikes with electric assist. Are you sure about that? How do they get charged? I had assumed that the argument in favour of keeping stationed systems is that the stations can provide the necessary charging functionality to support an eventual e-bike (or e-whatever) rollout. Electric assist is not really electric powered–you still have to pedal. They can be recharged by cycling, coasting etc by the bicycle itself. The operating company knows where the bikes are, and they are bringing batteries to the bikes when they gather them up and move them around. No idea if they all end up in one place as the earlier Pronto/Mobi bikes did. I will be surprised if we ever see empty bike “docks” on the Drive. I will bet that many bikes won’t ever be moved from the docking stations at all. Cyclists have their own bikes and destinations, which might not be where there are empty doc spaces for Mobis. Their own bikes are often clunkers, and anyway they have a secure place to secure them at work.